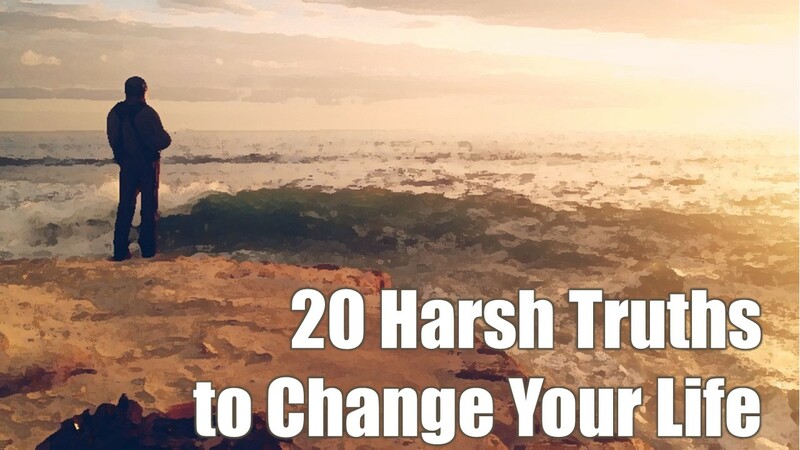 20 Harsh Truths That Will Make You Change Your Life - Motivate Amaze Be GREAT: The Motivation and Inspiration for Self-Improvement you need! They say "the truth shall set you free", and there is no greater truth to that than this article. It's better to listen to something we like than something we don't like, but the problem is, if that something isn't making us any good, in fact is limiting our own life, compared to what it could be. For life to change we need to get uncomfortable, we don't need the comfortable lies that makes us happy in the moment but not in the long run. What we need is the harsh truth, the truth that's uncomfortable, that will make us grow. 1. There Is No Magic Formula: people love a gimmick, something that promises wonderful results with little or no work (TV marketeers make millions because of this). There is no such thing, no quick fix, you have to do the work. 2. Spirituality Exists But You Must Take The First Step: Whatever you believe in (a greater power, religion or spiritualism, there is definitely something above us, something that ties everything) it will not manifest itself unless you take the first step. Practice what you believe in. 3. What's Done Cannot Be Undone: That's Shakespeare but it's also a reality. Things from the past cannot change and you can't undone them, but you can take them as lessons for the present. Focus on the present moment, and do things in the best possible way you can, remember... you can't undone them once they are done. 4. Every Negative Situation Has a Positive In It: Don't let negativity drag you, search for what's positive in the whole situation. Although things seem to be dark, you can always hang on to something positive that will make survive that negative time. 5. Simple Things Are THE ONES: We live with a constant illusion that bigger is better, the more expensive the better. But in reality, the simplest of things, things that anyone can do or have are the ones that make the difference: being kind, courageous, passionate, grateful, hardworking, caring, visionary, goal-oriented, just to name a few. 6. Doing Is More Important Than Knowing: You need to know what to do? Sure! But you need to do, if you want to really know. True knowledge comes from doing and experiencing what you have study or read about. 7. Following The Rules Won't Get You Far: If you really what to change your life, you cannot follow the conventional thinking and the rules society has imposed for you. Great things happen to those who dare to think outside the box, not following the path most follow. 8. Most People Won't Care About You, They Care What You Can Do For Them: You can call it "value". What's your value to this society? What can you bring to the world that's great? Something that makes a difference in someone else's life, that's what people expect from you. Don't focus if they care about it, because most don't. 9. You Will Never Know What The Right Moment Is: So you might well be prepared for any opportunity you may have. If you don't know when it's going to happen, you need to prepare yourself. Don't wait for the right moment, go forward and do it if you have done the work, there is nothing to fear. 10. Most Times What You Want Isn't What You Need: It's easy to understand this if you think about nutrition, sure you want that delicious chocolate cake, com'on?? Who wouldn't? But maybe, what your body needs is a not enormous sugar meal, but a more nutritional one, like a piece of fruit with natural sugars. Most thing in life, work like this, it's easier to go for the quick fix, but what you need it's the long term fix. 11. Success Doesn't Come At First Attempt: You can be called a successful person, although you failed sometimes. All you need to do is to be right one time, doesn't matter if it is the 2nd or 20th attempt, in reality that is the path to becoming successful. The trial and error method, for any mistake you make, you become better, and eventually you'll succeed. 12. The Outside Doesn't Matter If You Don't Work On The Inside: Looks are important, the way you dress, the way you talk, the way you brush your hair. but it all can fall if you aren't strong on the inside. So first things first, work on the inside, work on your mental skills, then, what the way you look, talk and act will be a reflexion of what you are on the inside. 13. When You Win, There Is More To Be Won: Success is not a final destination, like failure isn't. Although you won the battle that doesn't mean you won the war. More battles to come, more things to do. Victories can defeat you, if you don't acknowledge this truth. 14. The Best Adviser In The World is YOU: You now yourself like nobody else, truthfully in your hear you know what's better for you. Makes no sense to wait for people opinion's in order to make a big decision in your life. You can take them into consideration, but first and foremost listen to your inner you. 15. You Don't Have To Please Everyone: There will always be people who don't like you. You must be able to live knowing this and... not giving a damn about it! Yup, a friend to everyone is a friend to none, continue to be the way you are and you feel you must be, regardless of what others think. 16. Growth Comes From The Unknown: It's when you cross your limits and go to the unknown land that you grow. So you must not be afraid of the unknown, embrace the new path, do new things, things that will get you to grow and become better. 17. Your Genes Aren't Responsible You Are: If your number one excuse is "I have bad genes", then you aren't doing what you need to do hard enough. Once you set a limit on anything you won't grow. Telling yourself the story that your genes limit your growth is definitely the way of not growing. 18. Nobody Owes You Nothing: You can live waiting for what you think you deserve (probably won't get nothing...), or you can go out there and simply CLAIM what's rightfully yours! 19. Excuses Make You Smaller: Any excuse you give, compromises the natural ability we all have to learn and get better from it. Once you make an excuse, you don't admit your error, therefore you don't correct it. Repeat this procedure a few times, and your natural capability to learn will diminish, and you'll get smaller and smaller.